One of the great things about having my own business is that I get do things I love. Meeting new people is only one of them, and through attending networking events I’ve met lots of amazing and interesting people doing everything from financial management to garden design, dog-walking to catering and everything in between. Often I meet other people who, like me, are interested in holistic health and wellbeing and I get the chance to find out more about what they love to do, usually over a leisurely coffee (I love that too). At the beginning of July, at “Bubbles in Bishop“, I met Debbie Barber who is bringing together information on all sorts of wellbeing-related topics on her website Wellbeing Unlimited. Her mission is “to positively impact the health and wellbeing of the world, one person at a time… [so that] you can be the happiest, healthiest version of you!” And she’s a fantastic advert for what she does; she positively glows! Debbie interviewed me about Nia a couple of weeks ago. You can read th e interview on her blog. She has very bravely undertaken a Body Transformation Challenge and is reporting on her progress on the blog too. Take a look; you’re sure to find something of interest. My regular Nia classes have started up again after my summer break. A new block of five classes starts at Keep Fit Darlington and at the Pioneering Care Centre on Monday 7 August. Check out the dates on the Classes and Events page – there’s a Bank Holiday on 28 August and not all venues are open. Squeeze and relax the palm and fingers of your hand (think Open and Close. It’s exactly what you’re asked to do if you’re giving blood!) Change the amount of tension you use as you squeeze and sense increasing relaxation as you release. this move is good for building power in the forearms, fingers and wrists and can be helpful for those with repetetive strain injuries. Watch it here. Some of you may remember me telling you about a version of the Nia routine “Passion” which was set to the music of U2. 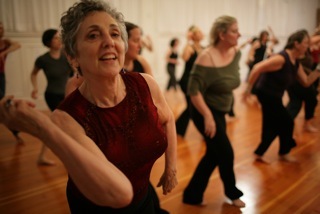 Well, here’s Marybeth Grinnan, the amazing Nia teacher who put the moves to the music talking about her passion for Nia. Regular Nia classes have started up again after my summer break. A new block of five classes starts at Keep Fit Darlington and at the Pioneering Care Centre on Monday 7 August. No class at Keep Fit Darlington or the Pioneering Care Centre on 28 August.